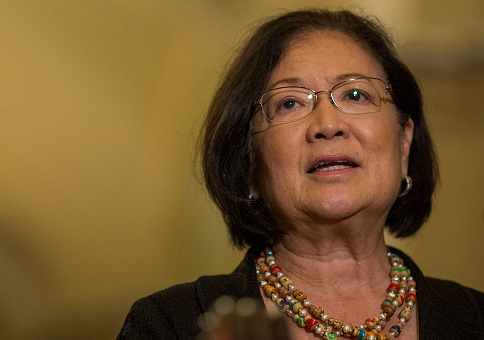 Hawaii senator Mazie Hirono (D.) has stepped into the spotlight this week following sexual assault allegations against Supreme Court nominee Brett Kavanaugh, blaming "men in this country" for perpetuating sexual assault and telling them all to "just shut up." Hirono's Democratic colleague in the Senate, Tom Carper (Del. ), who has admitted to punching his wife hard enough to give her a black eye, appears to be getting a pass from Hirono, who, even since his admission was revealed last January, has taken campaign money from him. Neither Hirono nor any of her Democratic colleagues have commented on the record since the Free Beacon uncovered a 1998 interview, in which Carper said, "Did I slap my wife 20 years ago? Yes." Not only have Democrats such as Hirono failed to address Carper's spousal abuse committed during his first marriage when he was in his 30s, but they have also continued to take money from him for their reelections. Hirono's campaign took $1,000 from Carper's First State PAC in June of this year, according to Federal Election Commission records. Hirono's office declined to answer whether she has discussed the issue with Carper and directed questions on the campaign contribution from him to her campaign. "Thank you for your inquiry, but we will not be providing a comment for this story," the campaign wrote in an email. Also taking money from Carper since his admission was revealed last December: Democratic senators Dianne Feinstein (Calif.), Claire McCaskill (Mo. ), Debbie Stabenow (Mich.), Tim Kaine (Va.), Sheldon Whitehouse (R.I.), Sherrod Brown (Ohio), Amy Klobuchar (Minn.), Heidi Heitkamp (N.D.), Joe Donnelly (Ind. ), John Tester (Mont. ), Bob Casey (Pa.), Bill Nelson (Fla.), and Joe Manchin (W.V.). Like Hirono, none have come forward to address Carper hitting his wife. Carper's office did not respond to an inquiry into whether he has discussed the incident with any of his colleagues. Carper denied the allegations throughout most of his political career, attacking opponents for their "vicious" efforts to "smear" him and his wife by bringing them up. Hirono has said politics shouldn't enter the discussion when discussing the serious issue of sexual assault and harassment. "As Americans, it's on all of us to take a stand and do what is right—regardless of political party," she wrote in an email to supporters on Wednesday. "It's time to stand up for victims of sexual assault and harassment." This entry was posted in Politics and tagged Brett Kavanaugh, Hawaii, Mazie Hirono. Bookmark the permalink.